Can you believe we're at Challenge #22 already? I can't believe I've only missed one challenge too. ;-) The challenges are hosted by the Studio L3 blog and there is loads of inspiration over there created by the Curiosity Crew. This go around we are on page 62 of Tim Holtz's book, A Compendium of Curiosities Vol. 3. It's a product challenge using the Dimensional Cutting Pad so it was about time I actually dusted mine off and used it. I wanted to make a super bright and cheerful card. Spring is coming! (Although some of you snow ridden folks might despair of that.) Be sure to cruise on over the Studio L3 blog and check out all the entries. You can play along with your own copy of the book. I also want to thank The Funkie Junkie Boutique for being the sponsor this time. Hi Lisa!! As I just commented to the only other entrant this far, we were beginning to wonder if ANYONE had the dimensional cutting pad! Haha. Your card is definitely bright and cherrful. You accomplished your goal! 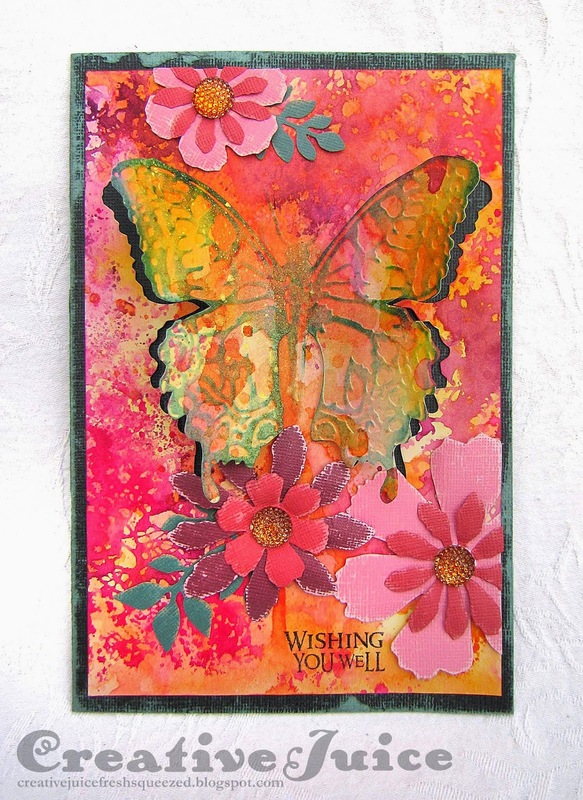 Your butterfly is beautiful and a perfect focal point for this lovely card. Thanks so much for joining us at CC3C. Beautiful, Lisa! That jumbo butterfly seems made for the dimensional cutting pad ~ love it! Thanks for joining us at CC3C. Very spring like! I think everyone needs some bright colors! Wow - these colors are wonderful, Lisa! They make me ready for Spring! The butterfly looks like it is popping out of the flowers! Great job! Thanks for joining us for this challenge! Your butterfly is just beautiful on this! Love these colors! Beautiful card, definitely reminds me of spring. Just stunning! LOVE the bold colors and that you used the butterfly! Thanks so much for joining us on this dimensional challenge at CC3Challenge!!! Yes, YES, YESS! That big beautiful butterfly is perfect for this challenge. I love the colors you chose. What a happy card this is! Just beautiful, love the colors you chose! Glorious sunshine colours - this is fabulous!